Black girls have long been subject to “adultification,” making them particularly vulnerable to sexual abuse. As outlined in the study “Girlhood Interrupted: The Erasure of Black Girls’ Childhood,” conducted by Georgetown Law Center on Poverty and Inequality, society’s historical willingness to treat “black girlhood as interchangeable with black womanhood” has rendered black girls seemingly less innocent, more mature, and unworthy of protection. The study further established “[I]n the public’s collective consciousness, latent ideas about black females as hypersexual, conniving, loud, and sassy predominate.” Because of this stereotyping, rooted in racial and gender bias, black girls remain perpetually at risk of sexual victimization. And when violated, they’re not sympathized with or afforded victim status. Instead, they’re persecuted and labeled facilitators of their own abuse. I know this to be true because it happened to me. When I think of my childhood, I recognize the ways in which I experienced adultification. As a girl, my lower body had a thickness that rarely went unnoticed by adults. My mother shared stories of me exiting dance class and other mothers whispering to her, “She has some body.” If my prepubescent frame captured the innocent attention of dance moms, it’s no shock that it was sexualized by a child predator. At six years old, I was molested. Although this man abused me once, he stalked and terrorized me over the course of several years. Undoubtedly, my home life and family structure left me within his reach. For years, a near-blind elderly woman babysat me while my single mother worked days and furthered her education at night. By nine years old, I was a latch-key kid, traversing long dimly lit hallways and elevators in a 19-story Bronx building. I was a girl navigating my environs alone and unprotected—like an adult—except I wasn’t. And my predator spotted that. Some time after I was violated, I’d finally summoned the courage to call on a trusted adult to shield me from this person who shadowed me throughout our neighborhood. I quickly discovered I wasn’t to be believed and was undeserving of protection. Worn out from the day, I dragged myself down my long hallway. As I passed the staircase, I saw him leering at me through a glass panel atop the staircase door. My tiny fist pounded on the door across from the stairwell. “Somebody is bothering me; he’s in the staircase,” I whispered to my mother’s friend. She narrowed her eyes before snapping, “Nobody’s there. I’m busy.” I squinted at the slammed door before looking over my shoulder and seeing he was no longer there—that time. The adultification I faced as a girl wasn’t thrust upon me solely by outsiders. I also encountered it within my own family. I shared an intermittent relationship that eventually turned nonexistent with my paternal relatives. My grandmother, staunchly loyal to my mostly absentee father, said to 12-year-old me after months of estrangement, “I thought you were pregnant or something.” She’d never seen me interact with boys, nor had I yet lost my virginity. For years, her words lived in my head. Why would she think that? I often asked myself. For the longest time, I wondered if she saw something in me that I hadn’t yet seen in myself. 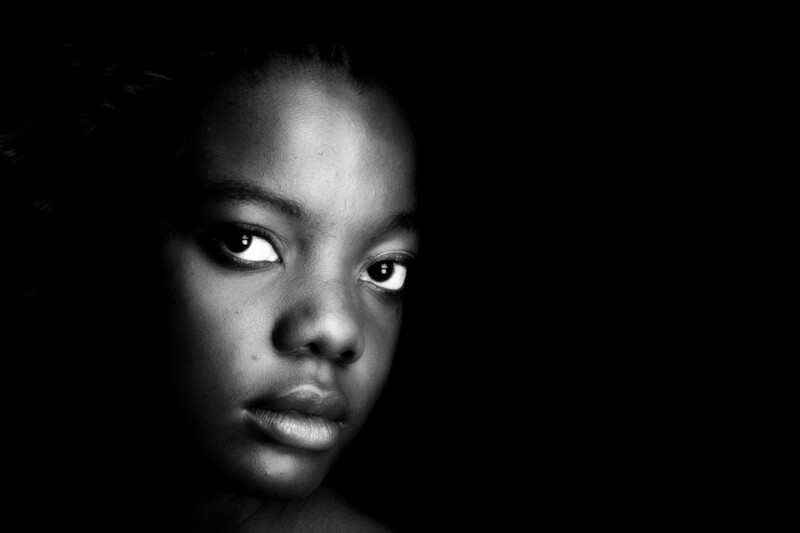 As the authors of the Georgetown study assert, “[A]dultification is a form of dehumanizing, robbing black children of the very essence of what makes childhood distinct from other developmental periods: innocence.” Racism, sexism, poverty, and segmented family structures have been weaponized against black girls, divesting them of their right to live freely and peacefully. Within families, schools, and communities, black girls must be allowed to be children and not morphed into little women. Our “villages” must aid in creating safe spaces where black girls can flourish in an age-appropriate manner unburdened by responsibilities and experiences that exceed their level of maturation. They’re entitled to the same nurturing, protection, and support so generously given to white girls. As the Surviving R. Kelly docuseries proves, no longer can society turn a deaf ear to black girls’ cries of “Me, too,” to their declarations that their lives matter—because they absolutely do. Have you or your daughter been robbed of your girlhood? Let’s work together to expose this painful reality and give our daughters back their childhood.